High end mobile graphics chips have classically suffered in two ways: performance and power. Performance never approaches that of desktop GPUs while power consumption results in short battery life and overheated systems. Nvidia's solution to these problems is the GTX 680M. As with previous mobile GPUs, the GTX 680M doesn’t offer similar specs as the desktop version, but the 680M comes close. It’s similar in architecture to the desktop GTX 670, offering 1,344 graphics compute cores and a 256-bit memory bus. Clock speeds will vary by system design, but the top frequency noted by Nvidia is 720MHz, lower than the 915MHz of its desktop cousin. The memory bandwidth is considerably lower, however, rated at 115GB/sec versus the 192GB/sec of the desktop GTX 670. The GTX 680M supports all the features of the desktop Keplers, including TXAA (a temporal anti-aliasing algorithm), adaptive vsync and DirectX 11. All systems shipping with the GTX 680M will also support Optimus, Nvidia’s GPU switching technology that allows system to run Intel’s HD 4000 integrated graphics for normal application use while firing up Kepler for gaming and other high performance graphics or GPU compute use. Adaptive Vsync prevents frame rate stuttering due to vsync. Typically, the graphics card is set to vsync, which synchronizes the frame rate with the monitor’s refresh rate. Normally, when a game’s frame rate drops below the refresh rate of the monitor (typically 60Hz for a normal LCD panel), the next step down is half the frame rate, or 30fps. That can result in visible stuttering, and if the game is constantly switching above and below 60Hz, the effect is annoying and immersion-breaking. Adaptive Vsync maintains vsync when running above 60fps, but disables it on the fly when the frame rate drops below 60fps. The result is a smooth transition to lower frame rates. You won’t find the GTX 680M in any Ultrabooks – it’s really aimed at desktop replacement systems like Alienware’s M17x, MSI’s GT70 and Clevo’s P170EM. These are beefy systems that weigh eigh t pounds or more, but are capable of near-desktop gaming performance. Typical systems will ship with 2GB of GDDR5 memory, but the chip can support up to 4GB of video frame buffer. Some systems, like Alienware’s M18x may ship with dual GPUs configured in SLI mode. 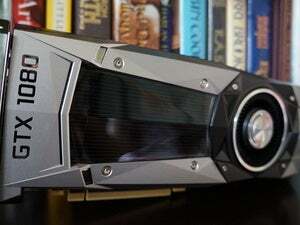 Nvidia is putting substantial efforts into 3D stereoscopic technologies, with support for Blu-ray 3D, Youtube 3D and other web sites supporting stereoscopic capabilities. 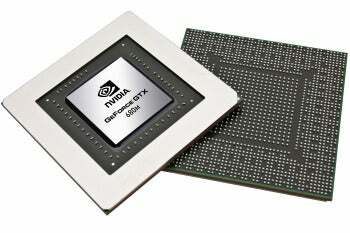 Nvidia’s mobile Kepler GPUs currently consist of the GeForce GTX 680M, GTX 660M, GT 650M, GT 640M and GT 635M. However, there’s a large gap between the 1,344 core GTX 680M and the 384 core GTX 660M. Nvidia hasn’t divulged when or if they’ll ship a mobile GPU with a core count between those two extremes.